Recently I upgraded my graphics card and Power Supply and I updated to the latest drivers. No other changes were made. I am now seeing it where every 3rd or 4th "session" I go to launch the game, I see the play button, click on it, the WOWS process loads for 3 seconds or so and dies. There isn't an error, Task Manager shows there being plenty of CPU, Memory, Disc, etc available. I do not run any mods and Safe Mode behaves the same. The game runs flawlessly when I am able to play it (I don't see crashes, lags, etc). Two days ago I did an uninstall and fresh install (nothing left from previous install) and have launched the game, quit the game, launched, etc without issue. I just went to load the game now and it is doing the same thing as before. The only way to work around this issue is to reboot my computer. I am hoping someone has some ideas or has fixed this issue. I have been playing for 2+ years and never encountered an issue loading game. Any ideas on how I can fix it or turn on some logging? I just logged a ticket as well. 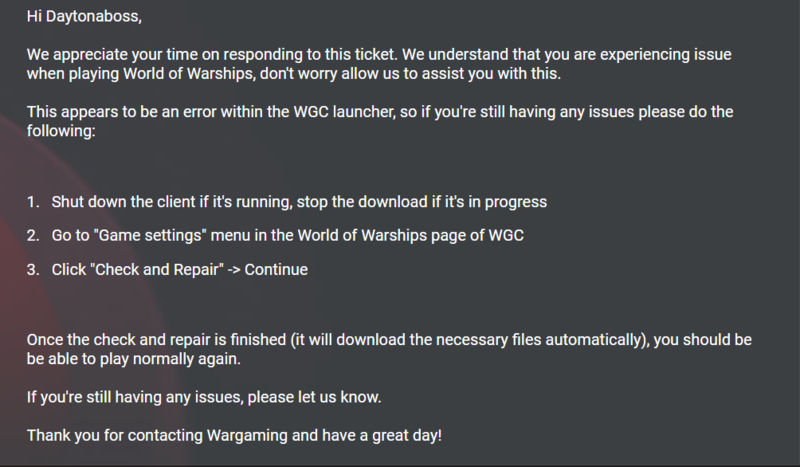 Maybe between WG and players something will get figured out. Having the same issue. I've gotten to where I just go double-click the proper .exe file in the WoWS folder. Not sure why the launcher is suddenly so unreliable. I'll have to try that is somehow 0.7.4.1 doesn't fix it... Thanks. It is an issue of not connecting to the server for some reason. I do get an error message after it does not connect with the newest patch. I am not sure why I wouldn't see this issue once in 2+ years. I upgrade video card and even do a fresh install and now I am seeing this issue. My internet is working and very fast, so the issue isn't my internet. A reboot works around it. Just now got logged into the game.